Adhere firmly and remove easily. Easy to write on. 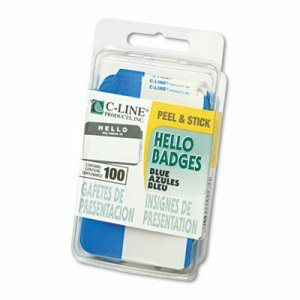 Name Badge Label Length: 2 1/4"; Name Badge Label Width: 3 1/2"; Name Badge Label Color(s): White/Blue; Name Badge Label Material(s): Paper. The distinct, solid color design makes this ID card reel stand out among others. 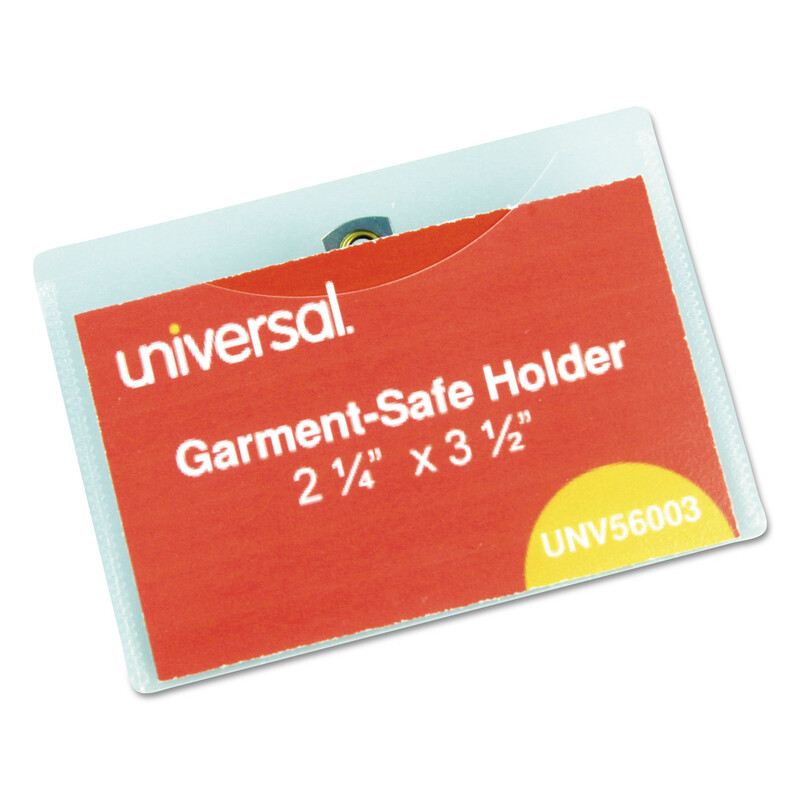 Attaches easily to any ID card or badge holder. Swivel style clip fastens to belts, backpacks or purses. 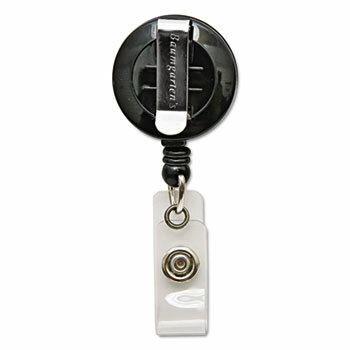 Compact badge reel extends 30 inches when needed and retracts automatically. Provides easy access to your ID; allows you to keep it securely with you at all times. Cord Material(s): Nylon; Cord Length: 30"; Reel Frame Material(s): Plastic; Color(s): Black. Durable lanyard is made from rugged, braided nylon so it won't break or fray over time. 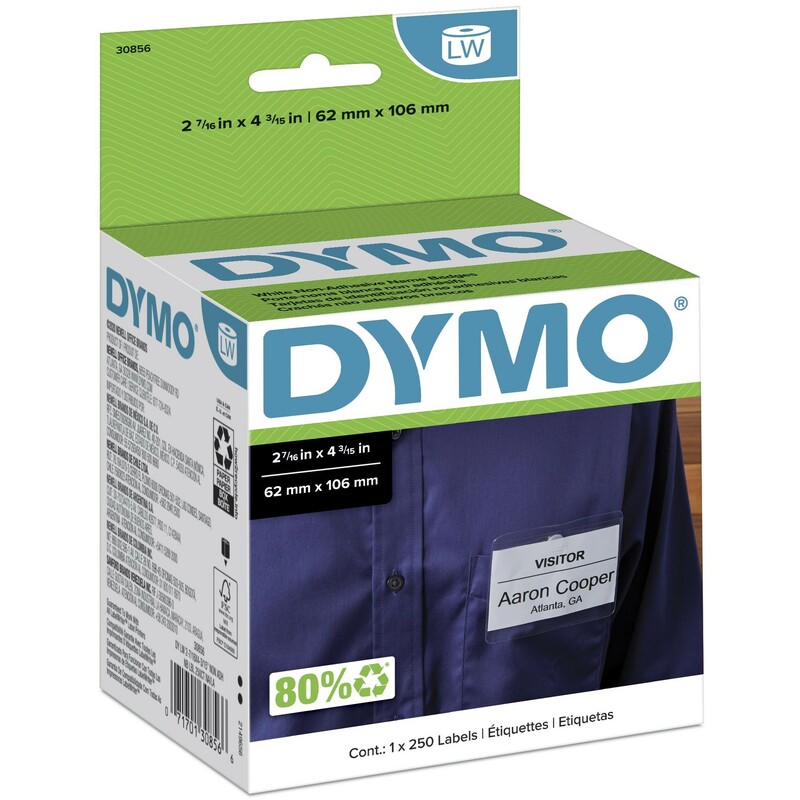 A lightweight metal clip on the end allows you to keep important pieces close to your chest for extra safety. It is great for holding badges or keys so you'll always know where they are. Hang your whistle on it for playing sports, camping or security. The lanyard is a comfortable length for all day wear. 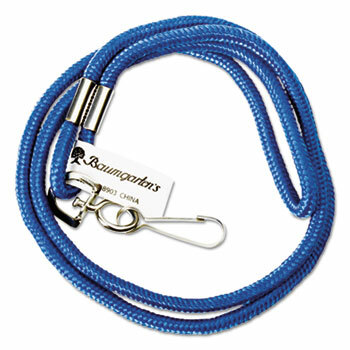 Fastener Style: Hook; Lanyard Color(s): Blue; Length: 36"; Quantity: 1 each. 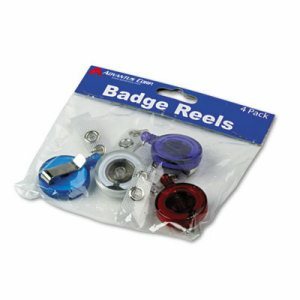 Heavy duty, metal-and-plastic round card reel is convenient for displaying your ID or security badge. Slide-style clip attaches easily to a belt, pocket or purse, ensuring that your ID card stays securely on your person at all times. Extends 30 inches when needed and retracts automatically for ease of use. 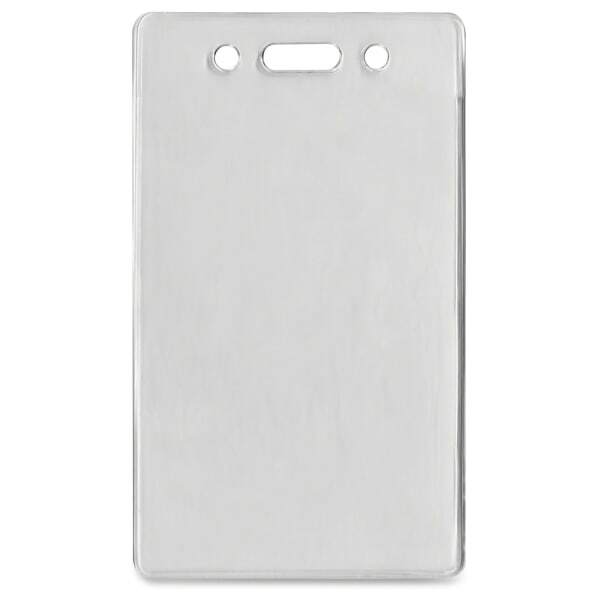 Provides a durable solution for easy access to your ID card, badge holder or keys. Cord Material(s): Nylon; Cord Length: 30"; Reel Frame Material(s): Metal; Color(s): Black/Chrome. This durable badge holder includes a loop for keeping your pen handy. 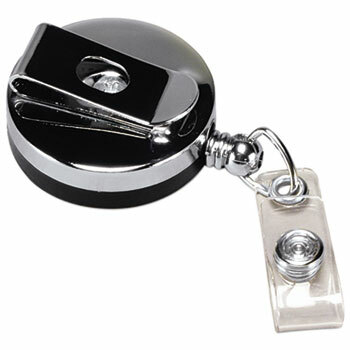 Metal-lined punch at the top of the holder allows for easy attachment to a lanyard or badge reel. Includes an additional hook and loop closure pocket on the back for cash, business cards, or other small items. Name Badge Label Length: 6"; Name Badge Label Width: 3 1/4"; Orientation: Vertical; Name Badge Holder Material(s): PVC. Distinct translucent design makes this ID card reel stand out. 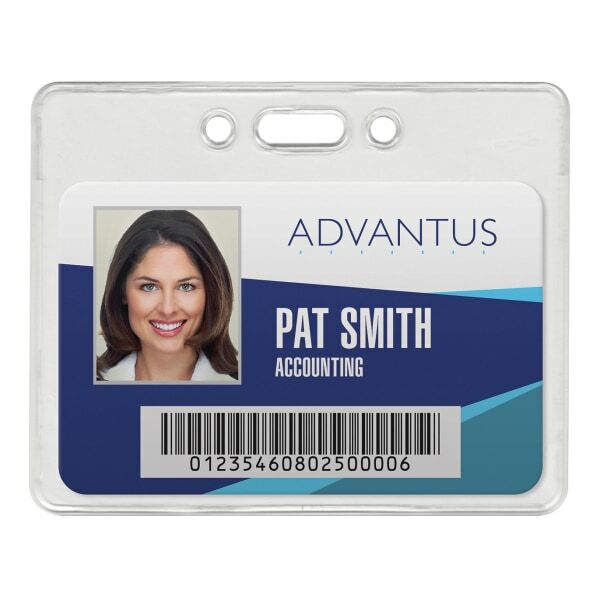 Connects easily to any ID card or name badge. Retractable cord allows convenient scanning/swiping of cards. Belt/pocket clip and clear badge holder. Cord Material(s): Nylon; Cord Length: 30"; Reel Frame Material(s): ABS Plastic; Color(s): Assorted. When you walk into an important business event dressed for success, you want to say more than "Hello My Name Is." 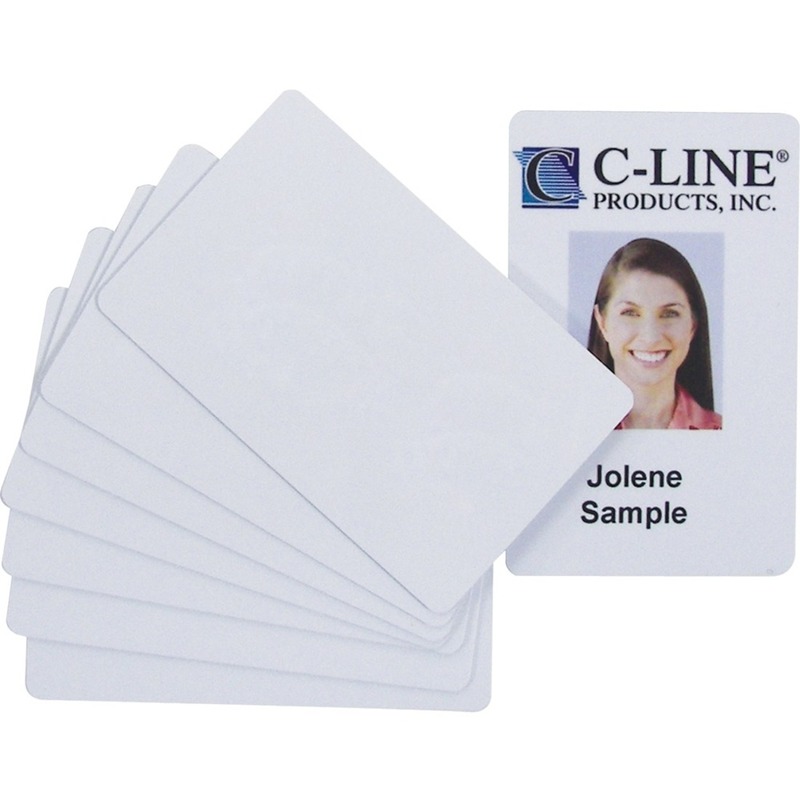 Be recognized with something that looks just as professional as you do�white adhesive name badges. Write directly on them, or use free templates from Avery� Design & Print to easily add specialized messages, text, graphics and logos on the spot at meetings or seminars. Improved flexibility makes the badges move with clothing and stick securely to fabric without curling at the corners or falling off. 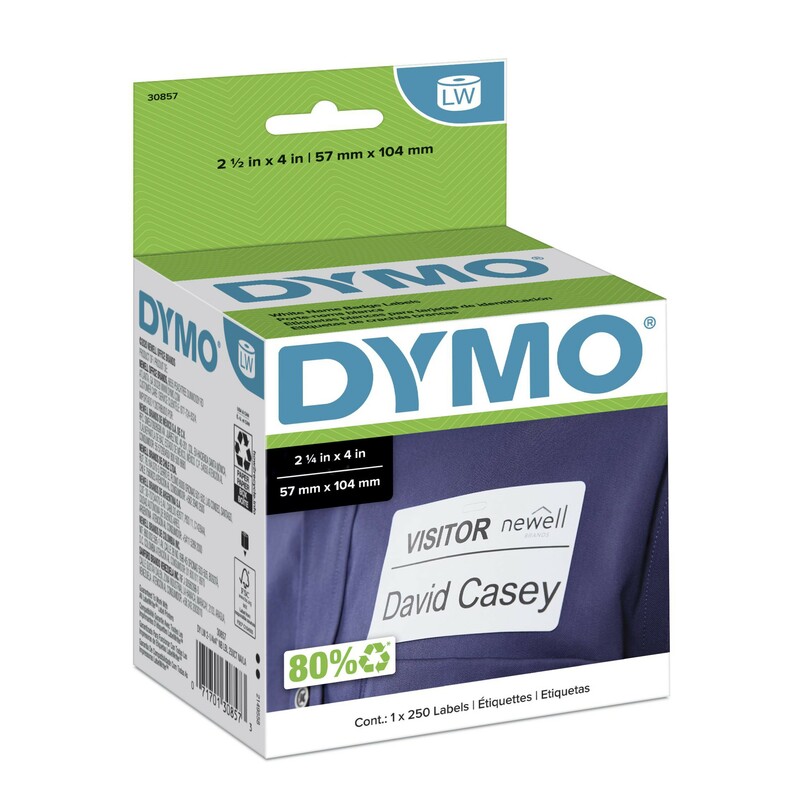 Peel-away design allows for quick and easy name badge separation in a large group. You'll spend less time worrying about your first impression and more time focusing on the business at hand. Name Badge Label Length: 3 3/8"; Name Badge Label Width: 2 11/32"; Name Badge Label Color(s): White/Blue; Name Badge Label Material(s): Paper. 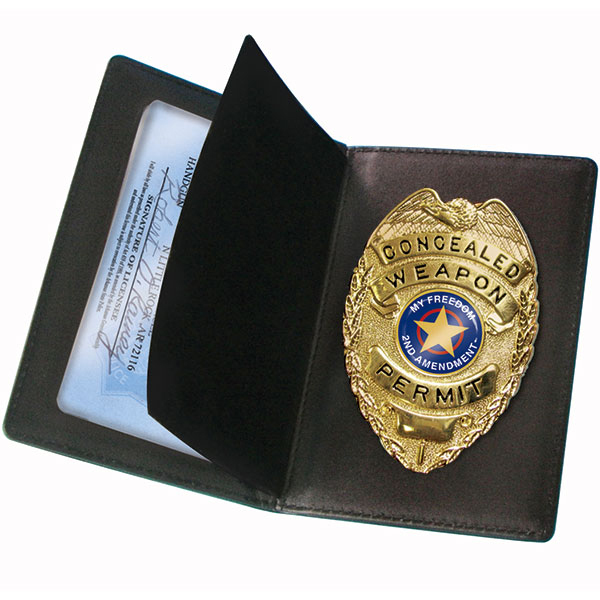 This law enforcement quality badge is master crafted; with a durable high luster finish and a strong clip attachment on the back. This wallet has window for your permit or ID. It's an absolute must for any person that carries a concealed weapon. 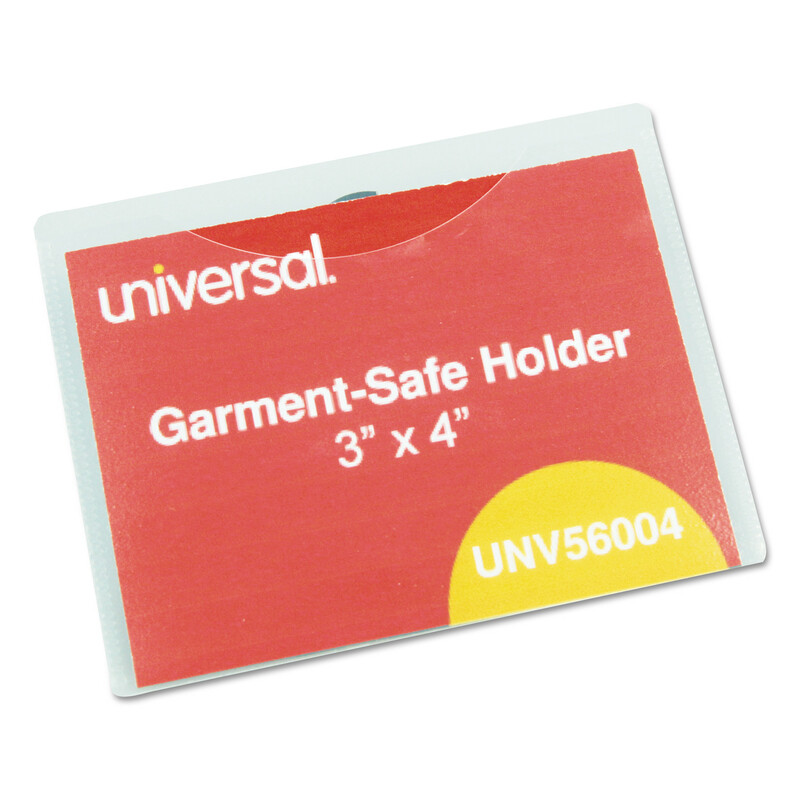 These compact, round, plastic card reels are convenient for displaying your ID or security badge. 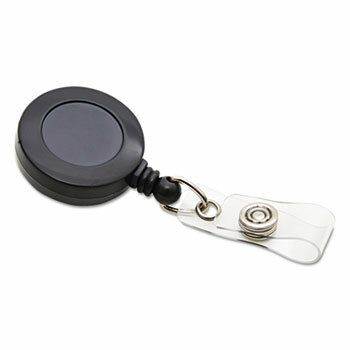 Badge reel attaches easily to any ID card or badge holder. Spring-style belt clip fastens to belts, backpacks or purses so you can keep your ID with you at all times. Extends 30 inches when needed and retracts automatically. Cord Material(s): Nylon; Cord Length: 30"; Reel Frame Material(s): Plastic; Color(s): Black. 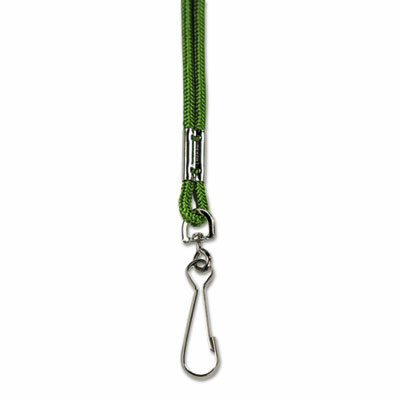 Durable lanyard is made from rugged, braided nylon so it won't break or fray over time. A lightweight metal clip on the end allows you to keep important pieces close to your chest for extra safety. It is great for holding badges or keys so you'll always know where they are. Hang your whistle on it for playing sports, camping or security. The lanyard is a comfortable length for all day wear. 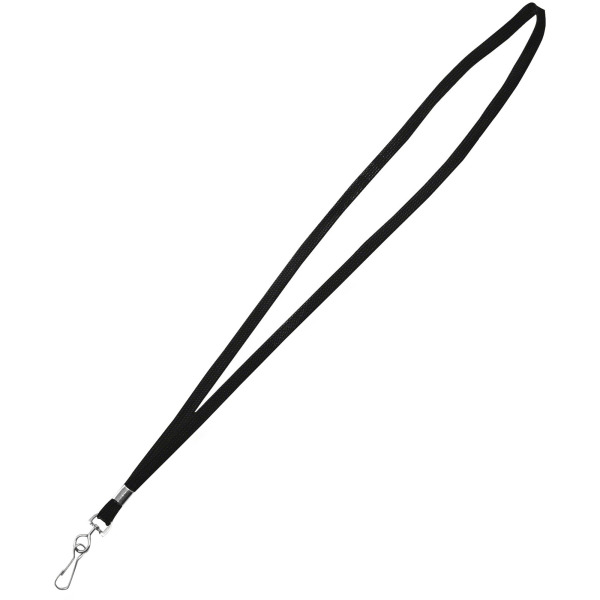 Fastener Style: Hook; Lanyard Color(s): Black; Length: 36"; Quantity: 1 each. 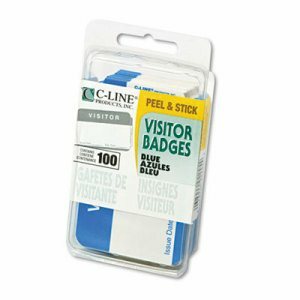 Badge ID holders keep valuable, high-tech proximity cards safe and clean. Thread a strap clip or neck chain adapter through to lock in place. Insert Width: 2 3/8"; Insert Height: 3 3/8"; Orientation: Vertical; Color(s): Clear. 40-Pocket Steel Swipe Card/Badge Rack, 4-1/8" x 18-11/16" 40-Pocket Steel Swipe Card/Badge Rack, 4-1/8" x 18-11/16"
Perfect for mounting near access doors and security entrances to organize swipe cards and badges. Forty-compartment rack of heavy-gauge steel construction. Predrilled holes for mounting. Color(s): Gray; Overall Width: 4 1/8"; Overall Depth: 1"; Overall Height: 18 11/16". Choose from a variety of badge styles: "Hello", plain or border-style. 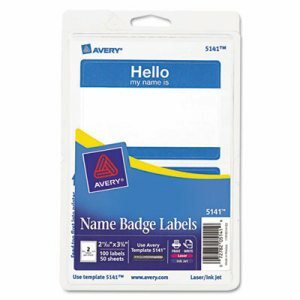 These versatile name badge labels let you add graphics, handwrite names or both. 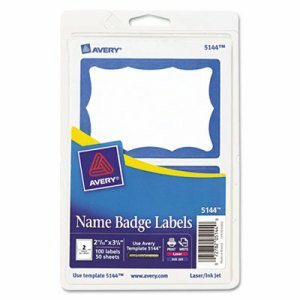 Easy-to-use Avery� Design & Print templates help you create professional-looking badges for identifying everyone at meetings and conferences. You can add a company logo at the top or a specialized greeting. You even have a selection of printers. How these name badge labels look is up to you. Name Badge Label Length: 3 3/8"; Name Badge Label Width: 2 11/32"; Name Badge Label Color(s): White/Blue; Name Badge Label Material(s): Paper. Create name badges instantly with your inkjet or laser printer. Plain inserts for clip, pin, magnetic and hanging style name badge holders. 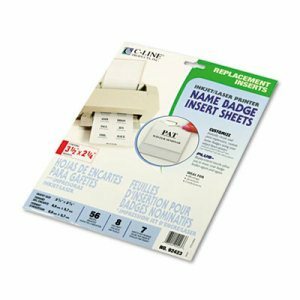 Insert pages are 8 1/2" x 11" micro-perforated sheets that also come with printer instructions that help to customize name badges. Works with built-in templates in Microsoft� Word and Corel� WordPerfect�, which can make it easy to make professional looking name badges for any event. Name Badge Label Length: 2 1/4"; Name Badge Label Width: 3 1/2"; Name Badge Label Color(s): White; Name Badge Label Material(s): Paper. 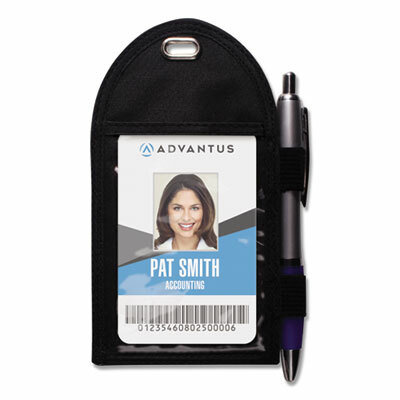 Provide everyday protection for your ID badge while maintaining easy access with a convenient neck pouch. This vertical neck pouch features an adjustable neck cord, a clear window so your ID card can be clearly seen and a tab to attach a pen. Versatile pouch has a top loading pocket to stash business cards and a zippered rear pocket for securing cash and valuables. Made of durable nylon. Pouch has a long, comfortable 42" neck cord. The pouch will hold any ID card up to 4� x 2 ��. Insert Width: 3 3/4"; Insert Height: 9"; Orientation: Vertical; Color(s): Black. Holds badge without attaching to clothing. Designed to keep identification information always in view. Secure way to keep credentials at your fingertips. 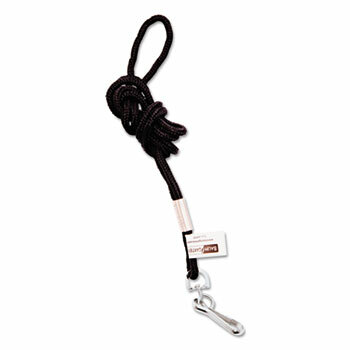 Fastener Style: J-Hook; Lanyard Color(s): Black; Length: 36"; Quantity: 24 per box. Holds badge without attaching to clothing. Heavy nylon cord for added strength. Durable clip holds ID securely around neck. Fastener Style: J-Hook; Lanyard Color(s): Assorted; Length: 22"; Quantity: 12 per pack. Design badges complete with names, titles and logos. No need to mess with margins�just type and print. After that, tear out and insert the badges into compatible name badge holders (available separately). 8 1/2" x 11" sheets for laser and inkjet printers. Larger badge for more information such as agendas. Tickets included are great as complimentary drink, parking or raffle tickets. Name Badge Label Length: 6"; Name Badge Label Width: 4 1/4"; Name Badge Label Color(s): White; Sheets per Unit: 50. Professional looking badge holders are versatile--you can use them for the office, meetings or conventions. Features swivel clips that give mobility. 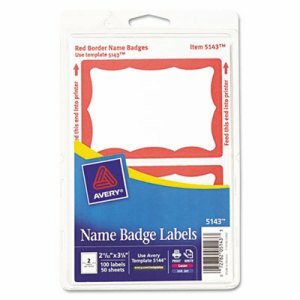 Name Badge Label Length: 4"; Name Badge Label Width: 3"; Name Badge Label Color(s): White; Name Badge Label Material(s): Paper. Carabiner-style clip offers a more secure connection and frees you from wearing an ID badge. 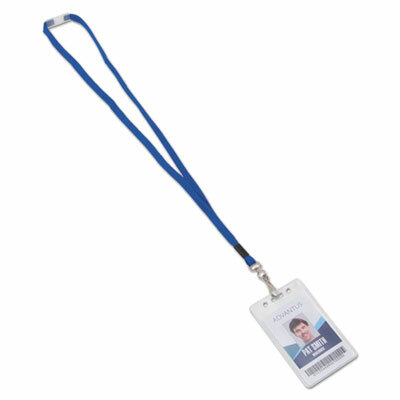 30" retractable cord allows convenient scanning/swiping and gives you instant access to badges, cards or keys. Cord Material(s): Nylon; Cord Length: 30"; Reel Frame Material(s): Zinc Alloy; Color(s): Smoke. 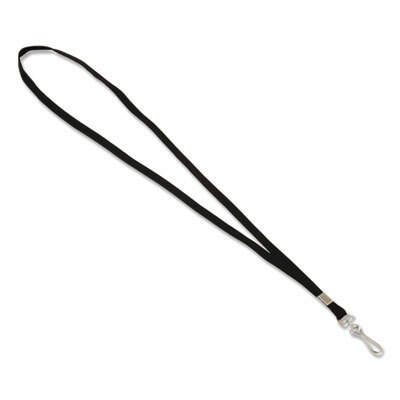 Soft cotton/nylon lanyard features a metal fastener to attach keys, name badges or cards. Fastener Style: J-Hook; Lanyard Color(s): Black; Length: 36"; Safety Breakaway Connector: No. Choose from a variety of badge styles: "Hello", plain or border-style. 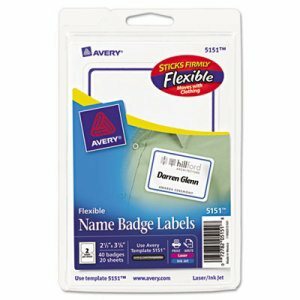 These versatile name badge labels let you add graphics, handwrite names or both. 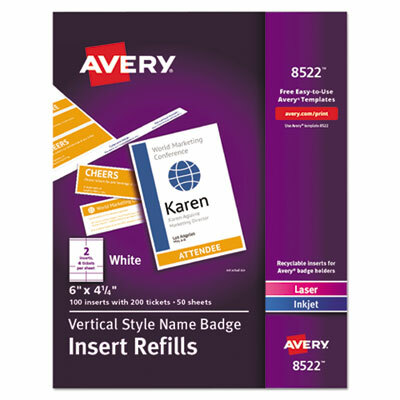 Easy-to-use Avery� Design & Print templates help you create professional-looking badges for identifying everyone at meetings and conferences. You can add a company logo at the top or a specialized greeting. You even have a selection of printers. How these name badge labels look is up to you. Name Badge Label Length: 3 3/8"; Name Badge Label Width: 2 11/32"; Name Badge Label Color(s): White/Red; Name Badge Label Material(s): Paper. Ideal for visitor management and large meetings. Faster and more efficient than running label sheets through your printer. High-quality label stock. Label Size - text: 2 1/4 x 4; Label Color(s): White; Machine Compatibility: PC Label Printers; Catalog Description: Adhesive Name Badge w/Clip Hole. These durable and lightweight breakaway lanyards are designed with safety in mind. Each lanyard is designed with a breakaway feature that ensures your safety if the lanyard is snagged, pulled, or caught. 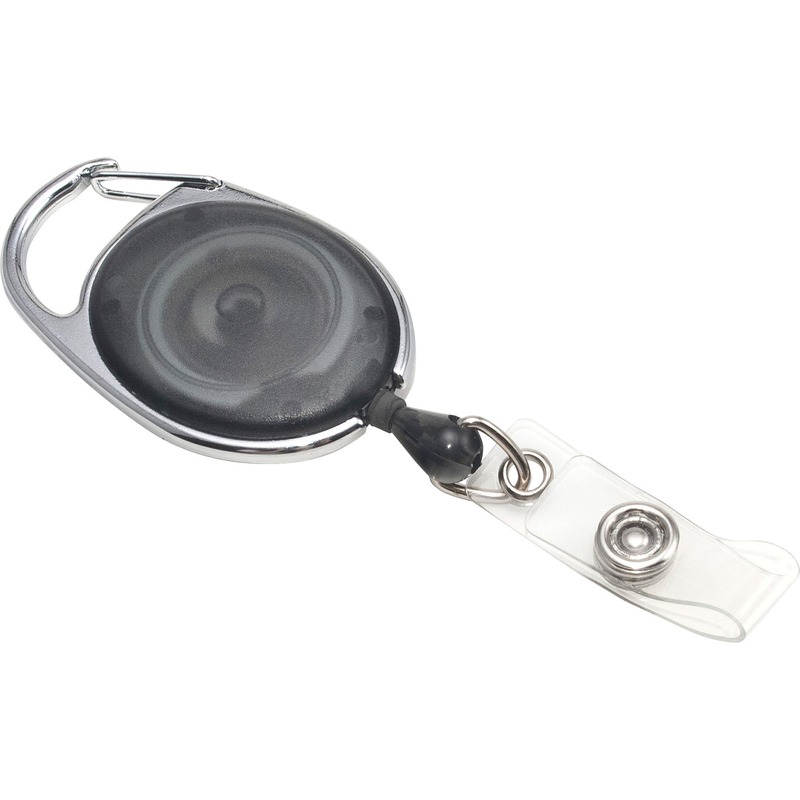 It's equipped with a durable J-hook for attaching identification cards or name badges. Fastener Style: J-Hook; Lanyard Color(s): Blue; Length: 36"; Safety Breakaway Connector: Yes. Anti-slip clip tilts on universal knuckle. Accepts materials up to 1/4" thick. Accommodates fixtures up to 1 1/8" thick. Frame Color: Clear; Size: 3 x 1 x 4; Message(s): Customizable; Insert Size: 5 x 7. 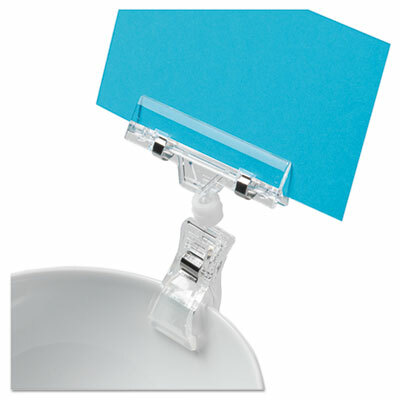 Professional looking badge holders are versatile--you can use them for the office, meetings or conventions. Features swivel clips that give mobility. Name Badge Label Length: 3 1/2"; Name Badge Label Width: 2 1/4"; Name Badge Label Color(s): White; Name Badge Label Material(s): Paper. Badge clips with mylar straps. For use with card-size life jackets/laminating pouches (not included). 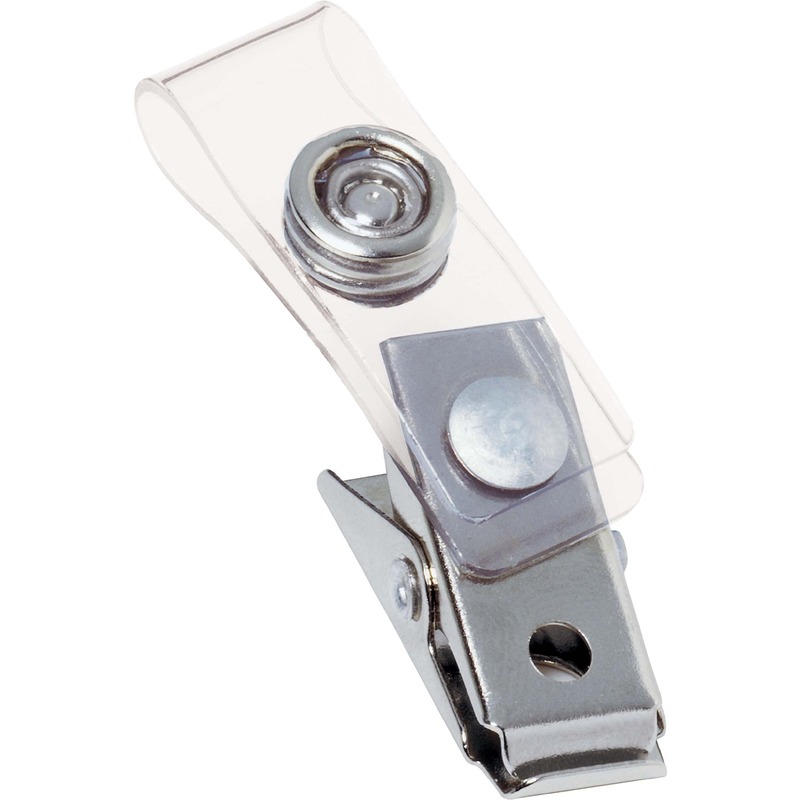 Clip/Clamp Type: Name Badge Clip; Color(s): Clear Strap, Silver Clip; Material(s): Mylar�; Width: 1/2". Ideal for visitor management and large meetings. Faster and more efficient than running label sheets through your printer. High-quality label stock. Label Size - text: 2 7/16 x 4 3/16; Label Color(s): White; Machine Compatibility: PC Label Printers; Catalog Description: Non-Adhesive Name Badge w/Clip Hole. 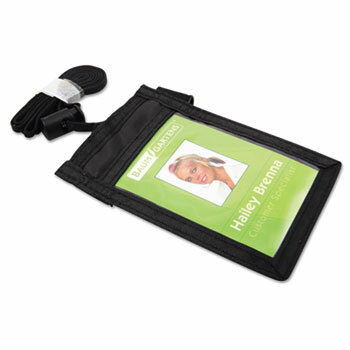 Badge ID holders keep valuable, high-tech proximity cards safe and clean. Thread a strap clip or neck chain adapter through to lock in place. Insert Width: 3 3/8"; Insert Height: 2 3/8"; Orientation: Horizontal; Color(s): Clear.